Description: In AP® Calculus AB, students explore the wonder of creation through mathematics. The course stresses both conceptual understanding and fluency in mathematical procedures. Students are challenged not only to get the right results but also to be able to justify their conclusions. Watch a short introduction from Course Developer Newton Quan. What topics will I learn about in Calculus AB? Working with functions represented in a variety of ways—graphically, numerically, analytically, or verbally—and understanding the connections among these representations. Understanding the meaning of the derivative in terms of a rate of change and local linear approximation, and using derivatives to solve a variety of problems. Understanding the meaning of the definite integral both as a limit of Riemann sums and as the net accumulation of change, and using integrals to solve a variety of problems. Understanding the relationship between the derivative and the definite integral as expressed in both parts of the Fundamental Theorem of Calculus. Communicating mathematics both orally and in well-written sentences and to explain solutions to problems. Modeling a written description of a physical situation with a function, a differential equation, or an integral. Using technology to help solve problems, experiment, interpret results, and verify conclusions. Determining the reasonableness of solutions, including sign, size, relative accuracy, and units of measurement. Developing an appreciation for calculus as a coherent body of knowledge and as a beautifully elegant, yet eminently practical aspect of God’s creation. Instruction will be given primarily through pre-recorded lectures. Reinforcement will take place through assigned practice, as well as a variety of opportunities for assistance and feedback, including weekly online class discussions. What books will I use in Calculus AB? The official AP® Calculus AB Booklist is now available. Please note that a TI-84 model or higher graphing calculator is required for this course. Am I ready to take Calculus AB? This is a rigorous, college-level course. 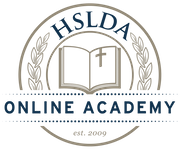 HSLDA Online Academy recommends that students have a strong background in mathematics before enrolling in AP® Calculus AB, preferably having completed courses in Algebra 2 and Pre-Calculus & Trigonometry. In particular, students will need to understand the notion of functions and be familiar with trigonometric functions. To ensure that you have the math skills you will need, please download and take the following Calculus Pre-Test before registering. Then, download the Answer Key and use your score on the test to assess your readiness for the course. Please visit the College Board page about AP® Calculus AB for a detailed list of topics students should be familiar with prior to taking the course and for more information about the material and skills students will study in the course and will need to master for the AP® exam in this subject. What is a Live Online Class Session in Calculus AB? What if I have a schedule conflict with listed Calculus AB class times? What is the tuition for Calculus AB?